We welcome your contributions to WOVEMBER WORDS! You can leave a comment on each WOVEMBER WORDS post, or you can email us; in which case, please put WOVEMBER WORDS in the subject. WOVEMBER Team Member Tom in particular will enjoy learning new words, and he will round them up throughout WOVEMBER. In the run up to WOVEMBER we found this old pattern leaflet. 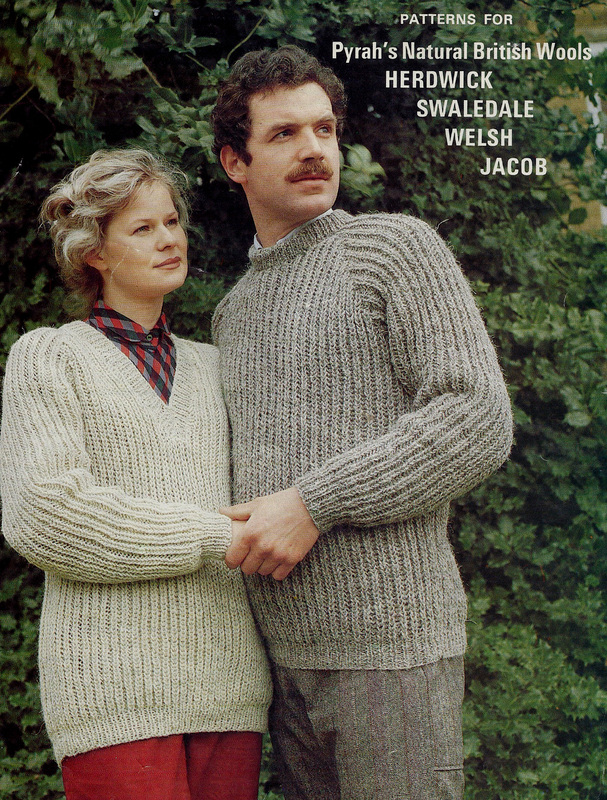 We thought you’d enjoy the text on the back and the picture of the happy couple on the front sporting WOOL grown in the Lake District! These wools are all genuine products of the true hill farming areas of the United Kingdom and in particular the Lake District, one quarter of which is now protected by the National Trust. The life of the hill sheep farmer is hard and rigorous with little financial reward. If these farmers were to forsake their native hills and fells the landscape would change dramatically and the whole system of sheep farming would be drastically altered. The National Trust therefore has a duty to help its tenants in any way possible to make the farming units productive. One way has been to make the public aware of the qualities of the coarser wools of the hill sheep which are well suited to hand knitting. These wool pattern leaflets demonstrate how the different wools can be easily blended to create outer garments which are both attractive and long-lasting. By buying the wool you are truly helping to keep the hill farmer in business! BRAVO! This is as true today as it was whenever the pattern and its accompanying notes were originally written! *) for our international readers: ‘elevenses’ are a true British institution: a short break for light refreshments, usually with tea or coffee, taken about eleven o’clock in the morning.